Over the past decade, a spike in demand for agricultural land in developing countries has generated a great deal of political and media attention. While many investments bring opportunities for communities, some have wrongfully pushed residents and workers off their lands or have caused social and environmental harm. Some development projects, including agroforestry initiatives and irrigation schemes, have also become embroiled in land conflict. Left unaddressed, escalating land disputes can result in project delays, increased operational, labour and legal costs, supply chain issues, damage to property, security concerns, and reputational harm. 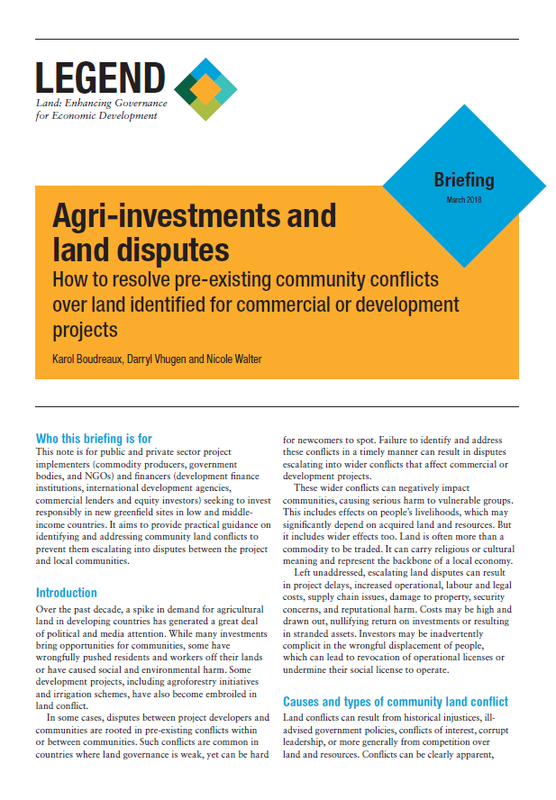 This briefing note aims to provide practical guidance on identifying and addressing community land conflicts to prevent them escalating into disputes between the project and local communities. The Cloudburst Group was founded in 2005 and is a registered small business providing management consulting services to public and private clients in the United States and internationally. We are a mission-driven organization, focused on providing solutions for issues around land, housing, and health. We are headquartered in the Washington DC area–in Landover, Maryland–with a network of satellite offices and consultants spread across the globe. Our mission is to build a fairer, more sustainable world, using evidence, action and influence in partnership with others.